HOW THE BEATLES CHANGED ALL OUR LIVES! A BEATLE PLAYS OTTAWA FOR 1st TIME! Alan Chrisman is currently(2017) working on a new book. It will examine how and why The Beatles affected all our lives-and from an original perspective. Paul McCartney Ottawa Concert Review by Alan L. Chrisman, (July, 2013). Paul McCartney performed in Ottawa on July 7, 2013. The first time any Beatle had ever played in Ottawa. I was interviewed before it on CBC radio of why, a half a century later, he and The Beatles were so still so popular. I managed to get 3 tickets, despite it being the fastest selling concert in Ottawa’s history. And I went with my Ottawa Beatles Conventions co-organizer, Al Whyte, and Tony Copple, Ottawa Beatles Site, co-founder. And being the Great Entertainer that McCartney still is, he put on an amazing show. Many later said, it may well have been one of the best concerts ever in Ottawa. He performed for 3 hours without a break. And at age 71!, which he didn’t look or act. And he performed many both Beatles and Wings classics including some obscure songs like “All Together Now” from Yellow Submarine, “Mother Should Know”, “Benefit of Mr. Kite”, Helter Skelter’, etc. he’d never done before. I had seen him in’89 in Montreal and there was no comparison. Modern technology, the light show and big screens made him and the band seem, ironically, more intimate(and the way he talked with the audience often) and allowed his excellent band to be able to accurately recreate the sounds and feel that the Beatles could never have created live in their day. And the band surprisingly really rocked with McCartney himself playing several instruments, including sometimes lead guitar. My friend, Al, has seen him a few times before but said too it was his best show and Tony was thrilled to finally get to see him live. And the next week somebody wrote to the Ottawa Citizen that he became a converted Beatles fan, after seeing the show. So anybody that was lucky enough to have experienced it, I’m sure felt the same. The media, as is their wont, seemed to focus their attention on the more rabid Beatles fans. They mainly interviewed now middle-aged women, who had undoubtedly had teen-aged crushes on the “cute” Beatle and had brought their daughters along for another generation to see. And they had interviewed a Beatles’ collector who seemed to have every version of every Beatles song and seen scores of McCartney shows. And even with me they had, evidently at first, wanted a Beatles “nut” calling me a Superfan. But during that early morning CBC radio interview I had tried to stress how for me, they had played a more important, perhaps, role and influence, which I had tried to outline in my book. Al and I took the bus down to Stamford, Connecticut. The whole Convention weekend, we just kept running into people who knew the Beatles: Alf their chauffeur; the son of the man who had designed their collarless suits; Yoko’s former husband; and even Paul McCartney’s step-mom. And there was a copy of manager, Brian Epstein’s, original contract with the Beatles, etc. Every guest had stories to tell, and it just got better and better. But I had really had gone to meet John’s first wife, Cynthia Lennon. I had read her book “A Twist of Lennon”. She was married to him for 8 years and was there when they first played the famous Cavern. I’d read how John, had had a chip on his shoulder because his father had deserted him at 6 years old and as a teenager, his mother had been hit and killed by a drunk driver( an off-duty policeman), just after visiting her at his Aunt Mimi’s house, the stern woman who actually raised him. Cynthia had met John at art school in Liverpool, this angry, sarcastic young man; complete opposites really. Cynthia the shy more middle-class nice girl and the tough (but inside soft)) rebel . What they had in common was their not being able to see without their glasses and their artistic sensibilities. And John had written many of those early songs about her. So I wanted to meet her and ask what he was really like, past the pop star and media image. I was later to embark on a journey to get to meet several who knew him throughout his life. I wanted to know about the man and the artist. We lined up to talk with her a few minutes and get a picture taken and have her sign several items, etc. She was exactly what I hoped she’d be: kind, lovely-blonde still, quiet spoken, and almost spiritual in a way. I went back and met her twice that weekend, and also ran into her in the elevator again, wearing her wire glasses, like John. It made my weekend and inspired me. Al, too, said it was the best weekend of his life. And then there were many more surprises. There were, of course, dealers selling rare Beatles things of all kinds. I saw a vendor had a rare BBC documentary tape, and I alerted a lady-guest who had worked for the BBC and known them on those early British radio and TV shows, and she made the dealer return this historic piece. And in thanking me, she gave me the contact for the Beatles’ now manager, and long time friend, Neil Aspinall (and this would come in handy in the future). But later, I would have another fortunate thing happen. There was a dealer (Geoffrey Giuliano; he’d also been the original Ronald McDonald) there who’d written several books on the Beatles and had amazing items he was selling from his personal collection. One was a rare original copy of Lennon’s “ROOTS” album of 50’s rockers of which only 5000 copies had been sold on TV, but whom Lennon later sued to stop. But he wanted more money than I could afford so I went back the next day to bargain with him. Most people were in the guest-talk room so there were few there when I noticed an Oriental looking woman talking to him. I heard him say to her that he had a special copy for her of his latest book on Lennon. I thought she looked a bit like John’s girlfriend in ’73 in California, when he was separated from Yoko during the infamous “Lost Weekend”. When he called her” May”, I knew she was May Pang. As I say, I was about the only one there, so I asked Al to run up stairs fast and get our camera. Meanwhile, she signed my copy of “Walls and Bridges” album; she told me one of my favorite songs on it, #9 Dream, was about her and that she was singing on it. It was such a surprise seeing her there! (she hadn’t been listed as a guest). And because she had been Yoko’s assistant (Yoko had even arranged for her to co-habit with John to take care of him, supposedly). I didn’t think she would perhaps get along with Cynthia because Cynthia and Yoko certainly didn’t. But it turned out that she was there to see Cynthia, because they were good friends. May also gave me her business card and she was now married to Tony Visconti, David Bowie’s producer. Also with her was Fred Seaman, Lennon’s personal assistant during his last years at the Dakota, whom Yoko would accuse of stealing John’s diaries. So it was a very tight knit group -this Beatle family. But the strangest encounter of all that weekend, was this tough-looking Italian guest we had seen all weekend, but had frankly stayed away from. But finally on the last day, we talked to him and he was the Beatles’ promotion man, Pete Bennett. He was the guy who went to all the radio stations to get them to play their records. With him was a shady looking character, a bit like a drug dealer, caring a metal briefcase? Pete Bennett asked if we would to see something special, so we duck into a small room where the telephones are and he starts pulling out acetates of various Beatle’s solo songs. Now acetates are the extremely rare and valuable 1st recordings (they only make a handful for the artist, manager, etc.) to hear advance recordings before they are pressed into records. Each one was probably worth thousands of dollars and they’re carrying them around nonchalantly. Another reason why I wanted to attend is that they had a concert later, by BADFINGER, a Beatles’ produced band, with several big hits such as “Without You” that Harry Nilsson and later Mariah Carey had big hits with. I had actually seen and met them back in Ottawa at Barrymores ( only two members were still alive, cause the two others had committed suicide) . This fated band was besides the Beatles, one of my all time favorite bands. So what a Weekend!!! And I said to Al, as we headed home, “WE COULD PUT ON OUR OWN BEATLES CONVENTION!” We had made lots of contacts, several Beatle guests had given us their business cards, and we had seen how it could be done. And in fact, we had brought our typed up Beatles ‘fantasy’ school project and I had given a copy to Cynthia Lennon and she seemed interested ( I had changed the guests from Yoko to her and her musician son, Julian, who had had a big hit with his own album). We boarded the bus back to Ottawa with #9 DREAMS in our head! To hear ROCK﻿ version ﻿of "THANK GOD FOR THE BEATLES" by The Gee Men, produced by Bryan Anthony go to www.soundclick.com and type song name in search. We stated holding Beatle meetings at an Algonquin College classroom. The first time only a handful of people showed up. Our teachers and most of our fellow former students were glad that a graduate of the class was actually doing their own event. 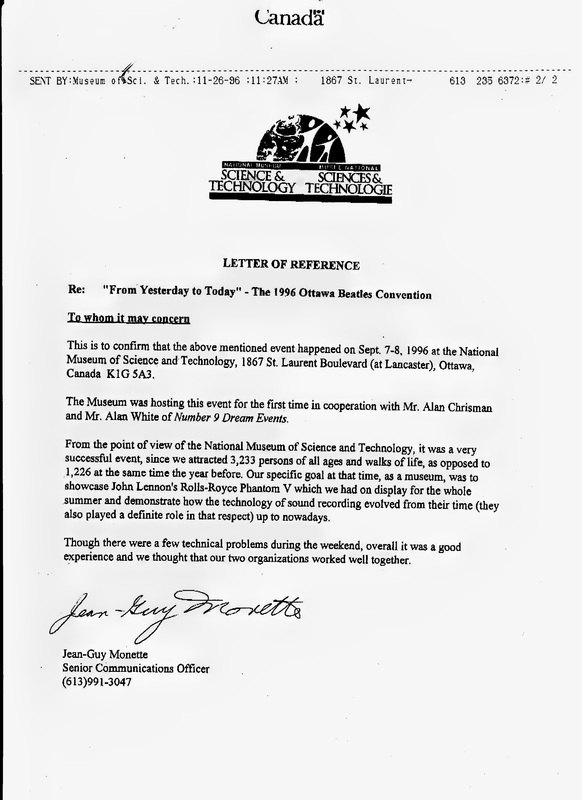 Most had hoped, at best, to get a job with one of the more corporate- sponsored tourist festivals which Ottawa, as a capitol, was known for. But soon word got around, and we ended up with over 50 volunteers. We had a game plan and map and everything from our proposed student layout. We could only afford to rent one big room at the Congress Centre. So the plan was to divide it into separate sections during the day and then open it up for the Pete Best Concert at night. We were going to have dealers selling Beatles items, (and we got them from Ottawa, Toronto, Montreal, even the States): a Beatles Gallery with rare posters, art work, etc. We set up separate committees for each area with one person at the head. I asked my Beatle’s friend, May, to organize the Gallery for example (she said she didn’t know how, but I knew she could). The idea was to let each person express their own creativity for their specific area. And our job was to coordinate all the parts and handle the overall event. Right at this time though, my co-partner and original planner, Al Whyte, got a much needed job back near Toronto, so suddenly I was running it alone. But there was no turning back at this point. We also planned to have several bands performing throughout the day and also that night, opening for Pete Best. 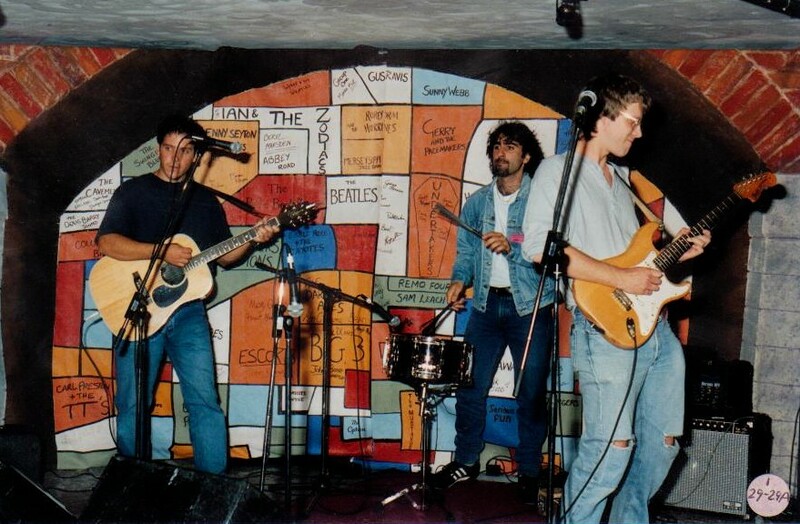 So I recruited several bands I was promoting: The Option, Bryan and his wife, “Heaven And Earth”, and a great new young band I’d discovered called “The Mustards “ I also just had to have the band” THE SHOOZ”, a excellent Beatles cover band, which had had quite a following in Ottawa in the 80’s. And another cover band, with W1310 DJ, Al Michaels, was to be in it called “Serious Fun”. They were all big Beatles fans and thrilled to play on the same stage as an original Beatle! And we had Beatles films all the next day, Sunday, at the Mayfair Theatre. My wife, Sarah, was organizing the children’s ‘IMAGINE’ art with children on that theme. Also we had found the perfect place to launch the event on Friday; a Cavern-like space in the basement of a club on Sparks St. called ‘THE CAVE’. And the media had finally come on board and we got great coverage by both CJOH-TV and CBC TV, etc. We had decided that the theme of the whole convention would be “CAVERN DAYS”. My old friend, Scott Stokes from the coffeehouse days, made a great poster with early pictures of PETE BEST and Stu Sutcliffe and even Astrid Kirchherr as well as the rest of the Beatles in Hamburg. I had another ace in the hole besides The BEATLES ANTHOLOGIES. I knew the top Beatles collector in Ottawa, Robbie Hartling. And he had amazing, very rare Beatles Collectables. Several of which he agreed to put on display including PAUL McCARTNEY’S own GOLD RECORD for the’ABBEY ROAD’ album. Somehow he had gotten it through a dealer years ago and it was already worth thousands. When Robbie showed it on CJOH-TV that weekend, the host had said, ”Quick, get the security guards”. One of the smartest decisions we made was to let children under 12 in free, thus making it a family event. We had thought it would mainly appeal to the Baby Boomers. But there was also a whole new generation of kids out there who were re-discovering The Beatles with The Anthologies , as well as their parents. I ‘d had a lawyer friend set up a registered company ”9 DREAM EVENTS” after Yoko’s quote, ” A dream we dream alone is only a dream, but a dream we dream together is reality”. But it was still very risky (I hadn’t actually told anyone that I only had about $44 dollars in the bank!!!) I knew the main act, Pete Best, was covered by the radio station, etc. But I can’t explain really my confidence in our dream, but these people believed we could pull it off and it just felt the right timing. But there were more personal problems going on too in the middle of all this. My marriage was slowly starting to have difficulties. As I said, I had stopped my store once again and with my wife’s encouragement, I had gone back to school. But I was suffering an identity crisis. Looking back now, I realize I would have been just about 50 years old during the Beatles Conventions and I’ve learned that men often may go through a mid-life crisis around that time and women, perhaps around 40. My wife had been having problems at her pressured teaching assistant jobs (and in those days mental illnesses were not so open). And I was feeling older and a bit trapped perhaps. Sarah had believed in my dream and had encouraged me all through it and she was a part of our upcoming convention. A young woman who worked on the Beatle Committee was in charge of the PR campaign. But we clashed because her PR friends had convinced her of a slick approach and I knew we didn’t have much money in reality. Her mother, an artist, had designed the backdrop for the main stage; a replica of the one at the Cavern Club. So it was all causing tension. And it all came to a head earlier in the day of the press conference set for the Cave. The woman and I had a fight over how much was being spent over the PR kit, right in front of the committee there. We went ahead with the press conference later as scheduled. Pete Best called in live from Calgary, where he was on tour, before he was to arrive in Ottawa the next day, Saturday. The “Mustards” played and Robbie held up his MCCARTNEY GOLD Record. Lots of media came and even Ottawa’s mayor. And I was to be interviewed live there for CJOH-TV. I was nervous and at the same time moved that our dream might be coming true. And then a funny thing happened, this lady, whom I had been fighting with earlier that day, asked if I’d like to have a massage before I went on camera. And then she kindly massaged my shoulders. I didn’t know whether she had felt bad about the argument or why exactly? But we still had a Beatles Convention to do. The next day we opened the Convention doors that afternoon and people were already lined- up. And it was good so far. Pete Best was scheduled to arrive around 2 p.m. but his flight was late. We kept saying he was on his way and people seemed anxious. We entertained them with bands, displays, and Beatles’ collectables for sale. Parent’s brought their kids to share the experience. 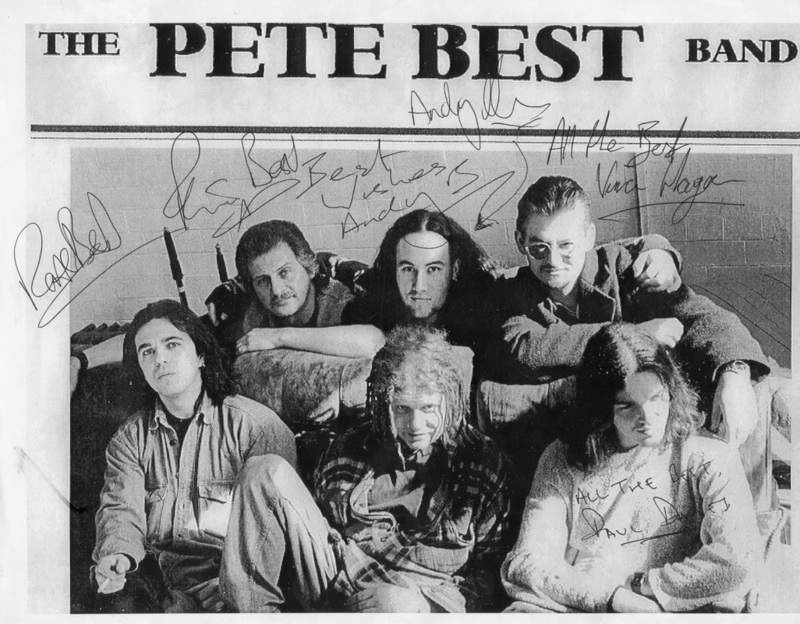 Pete was scheduled to sign fan’s items that afternoon and pose for photos and he would play the concert with his band that night. Finally, Pete is announced that he’s “Here!” The crowd grows and surges. There must have been 400 people there anyway. I figured we had to have at least a 1000 the whole day there to at least break even. But it seemed to be working. We also had fish and chips to go along with the British theme. Everyone was having a great time, the volunteers, the crowd, etc. Local TV was interviewing me and congratulating us. We had to change around the whole place during supper break, to make room for the concert. That evening 800 people show up. The manager of the Congress Centre said he was amazed; he thought we’d only get a couple hundred people. So that meant a total of 1200 people and not bad for Ottawa’s FIRST BEATLES CONVENTION! 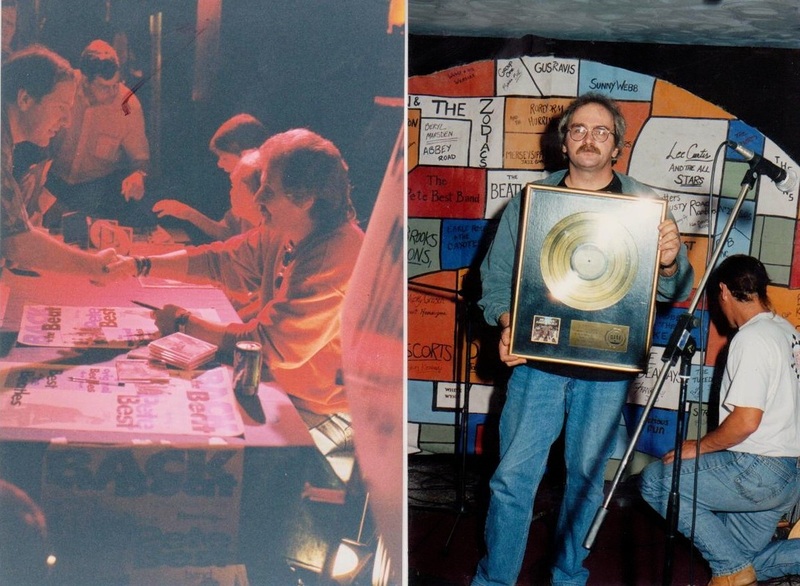 Original Beatles drummer, Pete Best, signing autograph(with Ottawa Beatles Site co-founder, John Whelan) and performing at Ottawa Beatles Convention'95 . Above CASBAH CLUB, Liverpool, owned by P. Best's mother,1st place Beatles played: Right: OTTAWA BEATLES ﻿COLLECTOR ROBIE HARTLING WITH ﻿McCARTNEY'S GOLD "ABBEY ROAD" RECORD. In fall 1996, someone from my old Beatles committee, informs me that they have John Lennon’s Psychedelic Rolls Royce on display at The National Museum of Science and Technology. I go check it out and there’s only a very tiny exhibit right around it. And I thought what a waste! Maybe we could put a whole Beatles’ Convention around it. People had been wanting to do another one. I approached the museum, and again it came down to one Beatles fan, a woman in the PR department. They thought it might increase their attendance for Labour Day weekend, traditionally a slow time for them, as everybody was closing up their cottages and getting ready for school to start. And it was the anniversary of the dates of our first convention. They offered it to us free rent in exchange and we’d have the use of the whole museum, not just one big room as before. So I said to my friend, Al, who had a Museum Technology degree, but who’d had problems getting a job in his field because he didn’t speak French-this is right down you’re alley! We called some of the old committee members and they were raring to go. I decided we didn’t need 50 volunteers and just picked a handful we could trust. Now we had to find a big name Beatles’guest. I had some ideas in mind. A dealer from Burlington, Ontario had said ours was the best convention he’d ever been to( as I said, we’d had a more artistic one; I even had my bands play their own original music as well as Beatles, and people would say ”That’s a great song, which Beatles’ album is that on? And I’d say the Beatles changed music because they wrote their own songs”). He put on a one day event at a comedy club earlier in ‘96 and I went. One of the guests there was ALLAN WILLIAMS, the Beatles’ first manager before Brian Epstein. Allan Williams, was also the man who had sent the Beatles to Hamburg, Germany. But they had refused to pay him his booking fee, once they found they could do it themselves and he advised Brian Epstein to, “not touch them with a ‘F’ ing’ 10 foot barge pole”. He was a real colourful character who basically ran a strip joint in Liverpool, they played early on in Liverpool. And the stories he had to tell. He showed there PAUL MCCARTNEY’S original LEATHER PANTS, which Brian Epstein, had gotten them to change out of, when he cleaned up their image. He also wrote what is one of the best books on what it was really like in their early days ”THE MAN THAT GAVE AWAY THE BEATLES”. Also there was Beryl Wooler, an assistant to Epstein and also once married to Bob Wooler, Dj at the Cavern, and one of their biggest early supporters. And one of The Quarrymen, Len Gary, in John Lennon’s early skiffle band before the Beatles. He told the story of HOW JOHN MET PAUL, because he was there that fateful day in July, 1957! John was drunk, playing with the Quarrymen at a church social in LIverpool, when this chubby, baby-faced kid (Paul) after, offered to show them some songs on his guitar. John only knew the few banjo chords his mother had taught him. Now John wasn’t anxious to share the spotlight with anyone else, but he was impressed. But he didn’t want to came right out and admit it, so he had his friend, Pete Shotten, (who also wrote one of my favorite books”JOHN LENNON, THE BEATLES, AND ME”), ask Paul the next day. And the way Len Gary told it was,” Paul rode up on his bike and saw Pete Shotten and Pete asked him and Paul just cooly replied, “OK”. Neither John or Paul wanted to reveal they needed each other. A lot of people may not know that both John and Paul had actually lost their mothers around the same time and their common pain put into the escape of their music also bonded them . So I had lots of contacts for my 2nd Convention. And I wanted to bring in my favorite Beatles-produced band, Badfinger too. But Allan Williams was a bit of a drinker and I knew I it could be a problem for our family event. And since the BEATLES ANTHOLOGIES, every Beatle person could demand more money, but I was determined to keep the costs down. I settled finally on an actual close relative of George Harrison, his sister LOUISE HARRISON. She was then living in Florida but had lived in Canada for a while. And she was willing to do it for less than it had cost me for Pete Best the year before. So Al and I started drawing up plans. We were going to use various rooms with themes, for example the satellite room ( the first worldwide video broadcasts: ”All You Need Is Love” and” Hey Jude”. And again we would have displays. We even had an artist recreate in chalk the Lennon “Imagine” plaque I’d seen in Central Park. And again we had several of my bands perform in the Museum’s theatre. This was to be even bigger than our first convention. It had also been timed with the next Beatles Anthologies being released but now this time all the people that ignored us before finally saw the potential; the Ottawa Sun newspaper, MAJIC 100 radio, etc. And people flocked to it. They came to hear Louise Harrison tell what it was like to grow up with George, be the only relative to ride with them on their trip to Washington,D.C. on their first North American tour, etc. She told an amazing story how George had visited her in a small Illinois town(I later visited) in 1963 , where she was living, completely unknown in America yet and had gotten up and played with a local band. Just a few months later, everybody was to know him on the Ed Sullivan Show. We almost had our problems too. The day we were to open the doors. The museum got scared because it was rumoured that the R.C.M.P. was going to raid us for “illegal” collectables. So we had to go around to each dealer and check he didn’t try to sell any. They were quite common items called “bootlegs”. The R.C.M.P. didn’t but the museum panicked! Meanwhile I discovered later that one of the local dealers (a part-time cop! who was mad at me for not letting him sell illegal stuff) was selling things out of his van in the parking lot. But it was an even bigger success than the year before. We had more than 3000 people come the whole weekend. We tripled their attendance for that weekend and highlighted their John Lennon’s Psychedelic Rolls Royce exhibit. AND, AND -we made enough money to pay for both that year’s convention and the rest of the previous year’s convention debt. BELOW: ALAN CHRISMAN, AL WHYTE(co-organizers), 2nd. 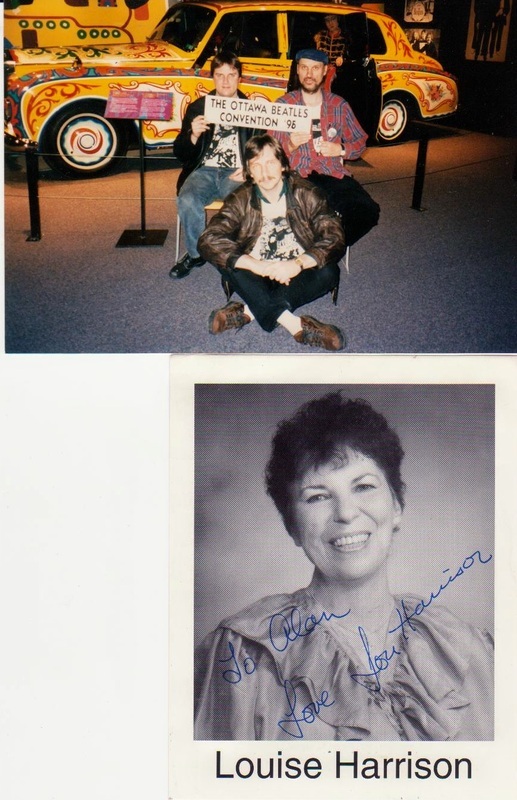 OTTAWA BEATLES CONVENTION'96, and YURY PELYUSHONOK in front of J. LENNON"S PSYCHEDELIC ROLLS ROYCE; Louise Harrison, (Georges sister, guest) at National Museum of Science and Technology; '96 Convention poster.